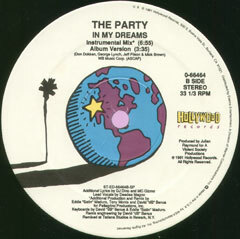 The Party - In My Dreams (instrumental) is the kind of record every DJ loves to find. Finding an amazing instrumental or dub of a truly awful record with a horrendous cover is gold dust as it means most DJs have overlooked it. I remember DJ Harvey pulling me out an appalling looking Modern Romance record called 'Tear the Roof off The Moose', at Record and Tape Exchange only to find it was a secret weapon. I even remember some DJs in the shop sniggering - who's laughing now fools ? I have lost count of the amount of great house records that are dubs of terrible tracks. I would always go straight for the dub. This was a bona fide Basics classic that I lay total claim to. I found it, I broke it, I rocked the floor with it for years - so there.